I was delighted with Hokey's suggestion for the "This is" theme this week. I don't see many movies these days, so its nice to think fondly back on my favourites! 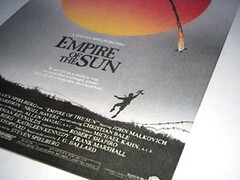 My very favourite would have to be Empire of the Sun (1987). This beautifully filmed wartime story, follows the journey of young English boy Jim, during the the Japanese occupation of Shanghai International Settlement. During the chaos, Jim is separated from his parents. He is first left to fend for himself and is then interred into a POW camp. Although it makes me sad, I never tire of watching this film. Its a poignant story about the loss of innocence. I love the cinematography and the opening is accompanied by a most ethereal piece of music. Watch the trailer for Empire if you have some time - it is accompanied by the beautiful piece of music, Suo Gan (a Welsh lullaby). The cast included a 13-year-old Christian Bale, along with Miranda Richardson, Nigel Havers and the incomparable John Malkovich. Thank you to Hokey for the great theme this week and to Angela at Three Buttons who is hosting "This is ...". I love this film, but it's time I got it out again and re-watched it. Great pick! Hope the birthday party was fun and your cake delicious! I forgot about this movie, I need to buy a copy so I can watch it! As soon as the trailer starts with that song it all comes back to you! Its funny to think that is Christian Bale as aboy! Great movie! that looks good - will have to track down a copy.